Hop bombs. They're not for everyone, but I love them. 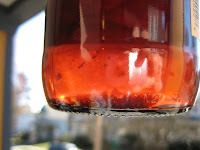 I borrowed Dave's bottle of Deschutes' Experimental Hop Henge to photograph for this post, and noticed the flavor crystals floating in the bottle (click on the photo for a closer look). Delicious and nutritious. More on Hop Henge below. Now that Russian River is distributed in Oregon, we have year-round access to Pliny the Elder -- we used to have to wait for the Oregon Brewers Festival to get that wonderful hop infusion. Pliny the Younger gives hopheads a new limited edition to crave: a double IPA that's even bigger and hoppier than its, er, father. Russian River had to find some way to keep the mystique level high. The Younger is a beautiful IPA. Deceptively light in color, it has an intensely floral hop smell and taste. It's bitter, that's for sure, but with the flowery bitterness that makes you feel all cheerful. Or is it the 11% alcohol content that does that? The keg of Russian River's Pliny the Younger tapped at Belmont Station Tuesday lasted nearly six hours, thanks to the 10-ounce serving size. The place was packed around 7:30 when I got there: the cafe was jammed, and the aisles of the store were full of people also. It's Imperial IPA week at the Station, so I was also able to enjoy a pint of Fort George's XIV Chapel -- I missed it at the recent barleywine festival. XIV is another big IPA that coaxes a perfumey jasmine flavor out of its hops. Wonderful. Pliny the Younger's hops reminded me a little bit of Hop Henge. Deschutes brewed two batches this year to see how much hop flavor we can take. The second batch comes close to matching the intense hoppiness of Pliny the Younger -- it may be technically hoppier but doesn't balance it as beautifully as the Pliny. 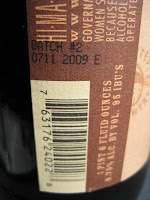 If you have a bottle of Hop Henge and don't know which batch it is, look just above the bar code. Batch #2 is marked as such. I can appreciate both, but I prefer the first batch -- it's nearly as hoppy as the second, without leaving a fuzzy coating on your tongue. Dave and I tried them side-by-side at the Portland pub a couple weeks ago, but as of today the website only lists #2 as on tap. Carla is no stranger to IPAs, but when I poured her a glass of batch #2, she took a couple sips and then gave up. Luckily I was able to take up the slack. If you ever see Pliny the Younger being served, don't even hesitate, have one. At least one. Hop Henge will be much easier to find around Portland. Oh! another hop bomb that's available right now is Lagunitas Hop Stoopid -- $3.29 for bombers at New Seasons recently. Ahhhhhh... Pliny the Elder! I remember it ever so fondly! A fine new dynasty is in the making! Po: This summer when you're here I can offer you the Elder anytime you'd like! "Flavor crystals?" I calls 'em "floaties." My friends are less forgiving of floaties in my homebrew. "Floaties", I like that. I guess it depends on what's floating. Don't the Chimay labels tell you to swirl the bottle around and drink all the floaties? Pliny the Younger- a Triple IPA folks, not a double. And if the Elder is hard to get, you can only imagine how the Younger will fair once it seriously hits Portland.